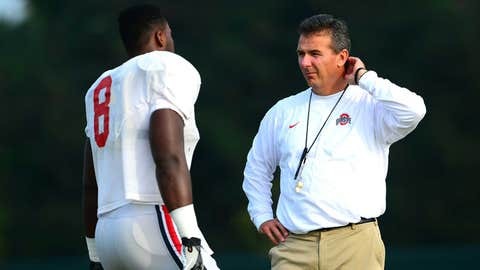 Ohio State Buckeyes head coach Urban Meyer talks with Noah Spence during practice. COLUMBUS, Ohio (AP) –– Ohio State coach Urban Meyer says he may know Tuesday about the availability of All-Big Ten defensive end Noah Spence, who did not travel with the team to the Orange Bowl because of a "personal issue." The Buckeyes are preparing to play Clemson on Friday night. Spence did not travel with the team Sunday. Meyer isn’t revealing details about the issue. The sophomore leads the team and is second in the Big Ten in sacks with 8.0 and is sixth in the league with 13.5 tackles for loss. Meyer also says cornerback Bradley Roby (knee bone bruise) and linebacker Curtis Grant (back) are still recovering from injuries and several players missed practice with a stomach virus.